Dr Simin Liu was born in 1976 in Wuhan, China. 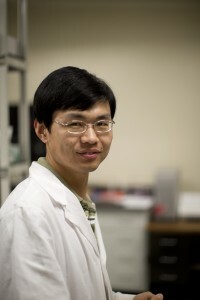 He received his PhD in 2004 from Wuhan University. After working on cucurbit[n]urils chemistry with Prof. Lyle Isaacs at University of Maryland, he joined Prof. Bruce Gibb’s group in 2007. His work while in the group focused on the synthesis of water-soluble cavitands and assembly of nano-scale capsules. Simin, left the group for a faculty position in April 2013.